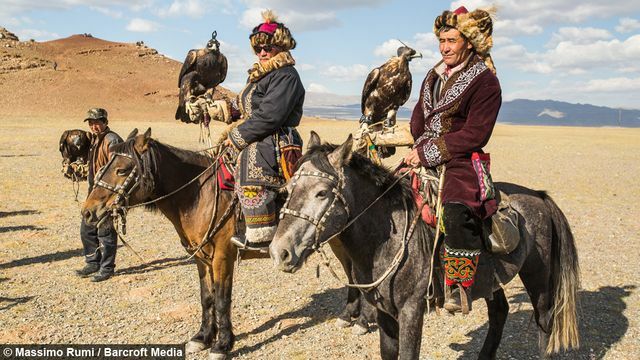 In The Eagle Huntress, Mongolia is romanticised as a mountainous former empire where adventurers send birds of prey to do their bidding before retiring to cozy yurts for stews by the fireside. This nomadic life has also appealed to tourists seeking a respite from modern urban life in tribal customs that have endured for over three millennia. These traditions are now threatened by harsh weather and weak support systems, prompting herders and hunters to join the ranks of the urbanites in Mongolia’s increasingly crowded capital, Ulaanbaatar. In 2017 an estimated 30% of the population depended on traditional nomadic animal husbandry for their livelihoods. This occupation has been undermined by successive "zud" weather patterns, featuring short hot summers and long cold winters, causing mass livestock fatalities due to freezing or starvation. Approximately 1.1 million livestock died in the winter of 2016 and aid organisations have called for support to repopulate decimated herds. In the absence of sufficient assistance in recent years, some 20% of the population has migrated to a ‘ger’ shantytown on the outskirts of the capital, which offers few public services or employment opportunities for new arrivals. Their plight contrasts with Mongolia’s mineral sector, which is rebounding after a dip in prices from mid-2014. The shortfall forced Mongolia to seek a bailout from the IMF to stabilise its finances, securing a USD 5bn package from the group and other sponsors in February 2017. The funding package is expected to increase Mongolia’s credibility with investors. Following the announcement of the funding, Axco Global Statistics forecast that the broader economy would expand by 1.09% in 2017 and by 5.95% in 2018, reflecting the uplift in commodity prices, especially coal, from early 2017. Economic diversification remains essential to broader prosperity in the long-term, however. Meanwhile, nomads who remain on the steppes are vulnerable to devastating seasonal losses. These losses are difficult to confirm in remote areas, increasing the risks for both policyholders and insurers. In response, the government has partnered with the World Bank to introduce an index-based system that awards payments based on local, rather than individual, claims. The claims are verified by official regional statistics, not policyholders. This system discourages fraud by making payments to all households based on regional conditions. Those who steward their resources well receive a bonus based on their neighbours’ misfortune, without reporting any of their own. Mongolia’s public-private partnership for index-based insurance could serve as a model for covering risks in remote areas of other emerging markets. The project introduced a new insurance scheme where payments are based on the total number of livestock lost by species and soum (district) rather than on households’ actual, individual losses. The index is compiled and maintained by the country’s National Statistics Office (NSO). The insurance program is a combination of self-insurance, market based insurance, and social safety net. Herders bear the cost of small losses that do not affect the viability of their business while larger losses are transferred to the private insurance industry. Only the final layer of catastrophic losses is borne by the government.